In this episode, we feature an interview with Lee Forester, Professor of German at Hope College, and Bill VanPatten, Professor of Spanish and Second Language Studies at Michigan State University. Stacey M. Johnson, Assistant Director for Educational Technology at the Vanderbilt University Center for Teaching, sat down with Forester and VanPatten at a language teaching conference last summer. 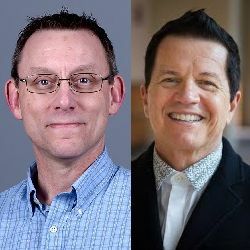 Both faculty members have developed online learning materials, including textbooks, for language instruction, and Stacey’s conversation with the two professors explored ways that instructors use digital textbooks and publisher-provided learning platforms. As a companion to this podcast episode, Stacey Johnson has created a new teaching guide on working with publisher-provided online platforms, shared as part of the Vanderbilt Center for Teaching’s collection of more than 70 teaching guides on various topics. The new guide features more audio from Lee Forester and Bill VanPatten, as well as other language instructors Stacey interviewed recently. Lee Forester is Professor of German at Hope College, where he teaches all levels of German. He is the co-founder of a small textbook publishing company called Evia Learning, and co-author of three language textbooks: Auf geht’s! (beginning German), Weiter geht’s! (intermediate German) and Ritmos (beginning Spanish). His research and curricular work focus on effective use of technology, intercultural learning and creating language materials that promote personal transformation for students. Bill VanPatten is Professor of Spanish and Second Language Studies at the Michigan State University. He has published seven books, seven edited volumes, six language textbooks (including the movies Sol y viento, Liaisons, and the tele series Destinos), and 120 articles and book chapters. Two of his articles are listed in the top ten citations for articles in Studies in Second Language Acquisition and he has received local and national awards for his research, teaching, leadership, and mentoring. He is a frequently invited speaker within the United States and abroad. He is also the host of a popular podcast on Second Language Acquisition called Tea with BVP. Derek Bruff: [00:07] Welcome to “Leading Lines,” a podcast from Vanderbilt University. I’m your host, Derek Bruff, Director of the Vanderbilt Center for Teaching. In this podcast we explore creative, intentional and effective uses of technology to enhance student learning, uses that point the way to the future of educational technology in college and university settings. [00:24] As I mentioned before, we have a team here at Vanderbilt conducting the interviews we’re sharing on the podcast. Each of us approaches the general topic of educational technology from our unique perspective, which allows us to explore many aspects of EdTech, here on the podcast. Joining me today is one member of that team, Stacey Johnson. [00:41] She’s the Assistant Director for Educational Technology at the Vanderbilt Center for Teaching ‑‑ one of my colleagues here at the CFT. Stacey conducted the interview we’re sharing in this episode. Stacey, would you set the interview up for us? Stacey Johnson: [00:53] Sure, Derek. I wanted to learn more about how faculty use digital textbooks and specifically the online learning platform provided by many textbook publishers. [01:04] I invited two of my favorite colleagues, both materials developers and faculty members, to sit down for a chat with me at a language teaching conference this past summer. [01:13] Lee Forester is professor of German at Hope College, cofounder of a small textbook publishing company called Evia Learning and coauthor of three language textbooks in both German and Spanish. His work focuses on effective use of technology, intercultural learning and creating language materials that promote personal transformation for his students. [01:34] Bill VanPatten is widely known for his work in second language acquisition and as the host of the popular podcast about language teaching called “Tea with BVP.” He has published six language textbooks ‑‑ all of which, I am excited to tell you, include innovative digital components such as telenovelas and full‑length documentary films ‑‑ seven books, seven edited volumes and 120 articles and book chapters. [02:04] Because Lee, Bill and I are all language teachers, we often talk about language teaching during the interview and the importance of communicative language teaching and meaningful interactions. [02:16] For our listeners that are not language teachers, I want to tell you that communicative materials require students to go beyond the memorization of discrete points, like grammar and vocabulary, and actually interact in a meaningful way and use the language they’re learning. It moves instruction out of the realm of the theoretical and asks students to engage in performance‑based activities. [02:37] As you can probably imagine, it’s not easy to find good digital materials that emphasize communicative tasks rather than the memorization of discrete items. In this podcast, Bill and Lee help us understand why that might be. [02:52] I started off by asking Lee and Bill how they got started in publishing online learning materials. Lee Forester: [03:00] Many years ago, I felt there wasn’t very good use of technology for my immediate need of beginning German classes. There were these course management systems and other things, but I didn’t think the activities were designed very well. [03:11] I felt that, in what was before ‑‑ and now we call flipping the classroom ‑‑ but my feeling was we needed to get more use and get more comprehensible input to students outside of the classroom and not rely solely on instructors to deliver that in class as I was taught in the ’80s with communicative teaching. [03:27] I started working on an alternative textbook. About half of the content would be multimedia. There would be lots of audio, lots of listening. Stacey: [03:36] What year was this? Lee: [03:38] I began working about 2000, a little bit before that actually. This is what eventually turned into “Auf geht’s!” and Ritmos later. Auf geht’s! Came out in 2005. Multimedia based, software based. It wasn’t a web based thing at that point. [03:51] One of the main goals of that was to have students work a lot more outside of class than they were doing. My experience with standard textbooks was simply that they didn’t do it. If you gave them a reading piece, they weren’t interested in it, they wouldn’t do it. You would see students maybe writing furiously for a couple minutes before class and that was for their outside engagement. [04:08] I wanted a platform with a computer that would give them something that would focus on their short attention spans, give them some challenging tasks outside of class that they would actually do before they came to class to magnify the amount of time that they spent on tasks, which is an important part for language learning. [04:24] That was some of my initial reasons to get involved in trying to produce language‑learning multimedia. We started in the late ’90s and got a FIPSE grants and did development. FIPSE is the Fund for the Improvement of Postsecondary Education. [04:36] That was probably right around 2002‑ish, 2001. Then we worked on it for a number of years, then we released the first version in 2005. We could not work with a traditional publisher because we didn’t want to give them any control over this and they wouldn’t have funded it anyway. [04:52] We wanted to do things like shoot our own photos for a really large budget. They didn’t want to do that. We wanted a lot more control. We decided ‑‑ we being my partner David Antoniuk and I ‑‑ to start our own company to do it. Bill VanPatten: [05:04] I got started in technology in the mid ’90s actually. I was acting chair at the time in my department. What happened is the university had just decided that it wanted a three‑semester requirement across the campus for languages. [05:19] No matter what discipline you were in, no matter what school, you had to take minimally three semesters of a language. Of course we all know what language is going to get hit the most by that, Spanish. The potential problem that we would have anywhere from 50 percent to 100 percent increase in student population, but no budget for instructors and TAs and so on. [05:40] This is before there was anything you could find out there in the…so we used a local platform that was developed in Urbana, called Mallard, because ducks have web feet, get it, web. [06:22] The person in charge of the program didn’t really know what to do with that credit and was using commercial materials in a company that shall not be named, and just making students to stuff on language was…students hated it. [06:37] When I came in and took over both Spanish and French, the dean charged me with “Bring this thing into line here, make this work.” I developed all the online materials myself, along with Lee Anne Spino, who was my researcher at the time, and Daniel Trego helped, of course, he was our technology person. [06:57] Then I hired Walter and Walter came and started helping us his first year. Then, within two years, we had completely redone the Spanish program and then I turned around and did the French program in the same way. [07:10] As I’ve told some people I’ve worked with in publishing industry, hybrid language instruction has to be local. If you try to commercialize it, it’s not going to work because publishers don’t know how to make the right kind of materials for online environments. Bill: [07:53] about this vicious cycle where publishers produce what people want and people tell publishers what they want and there is no way for advances in language teaching to happen for people like us, me and Lee, and other people to break in. [08:08] What we want to do and what we know should happen — in textbooks, outside of class, in class — it’s not going to make it in those textbooks because the consumer doesn’t know what to do with it and it’s all about why textbooks aren’t communicative even though they call themselves communicative. [08:24] What we have to do is educate the consumer, the public, so they ask for materials that aren’t there. That’s the only way the publishers will do it. Or you do things like start your own companies. Stacey: [08:37] One thing I’m interested in, though, you actually worked within the existing system, you worked with big publishers and you still managed to come out with electronic supplements for textbooks that are really useful. So…? Bill: [08:49] Yes and no. Stacey: [08:50] Yeah. What do you think could be improved? Bill: [08:53] I have been ‑‑ maybe Lee will disagree, I don’t know ‑‑ but I’ve been looking at text books the last five years or so, I think textbooks have taken a major step backwards. They are less communicative than they were before, they’re less proficiency oriented than they were before and the stuff that’s available as homework and online is worse than it was 10 years ago. [09:13] I don’t know what’s happened. I don’t know and I’m speaking for Spanish, a little bit for French, too, because I work in both languages, I can’t speak for German or Russian and other languages, but I have my suspicions. [09:28] Something’s happened where there’s been a regression. It’s a lack of knowledge, it’s a lack of the ability of the consumer to ask for something different. [09:39] I kind of think I know what’s happened, but I would be speculating. In my own materials, I can’t vouch for certain because I don’t create all the online stuff because textbooks are so unwieldy to do. That’s why you have a team of four people doing a textbook. [10:06] They take care of it, and next thing you know, it’s not what you really want, but it’s too late. Lee: [10:11] See, and I would say you should almost do it the other way around because that’s the key component for student’s work with outside class and instructors we can kind of work with. We can train our instructors to teach better in class or to handle things. [10:21] I think it’s a real shame that what is really the key things students interact with outside of the classroom gets the worst of the resources. Bill: [10:28] I would agree, but that’s because publishers are still operating…this is another thing, we had discussion about another topic earlier, is that, why, Lee you tell me this, I’m going to be Lee now, why are we such a book bound culture? [11:04] Publishers have this model of a textbook with other things around it, so when we did…I won’t say who it is, but a particular publisher we worked with, we wrote this fabulous movie and what we wanted was a movie for the textbook. [11:51] You know, you got something to talk about because that’s what we do. Stacey: [11:56] You actually said that you think all hybrid instruction has to be local, which I think ties into the textbook thing, people don’t develop their own hybrid instruction because they’re dependant on that outside publisher‑based resource, right? [12:38] I think if you do that you’ll rapidly find that there’s really not much going on, and this is why the students feel it busy work. It’s not connected to their real lives, they don’t see any of their own skills developing. [12:47] It’s hard then…I think something commercially has to be available because otherwise you have to be a large school with enough money to pay for a team of several people to create these things. [12:57] What happens to the community colleges, the high schools, the less endowed state universities that don’t have those resources. I think there’s space, actually, of course I believe there’s space, for smaller publishers that aren’t a part of the big four or five to actually intervene here and create some stuff that can be used or adapted. Could be localized even if it’s not local somewhere else. Bill: [13:16] One thing we’ve done is we’ve made our materials available, people who adopt this book, which is obviously one of my books, we’ve given those materials away for them. I gave all the online materials that we have, if they want to hybridize, or they want them in addition to not hybridizing, just because they want good quality outside materials. Lee: [13:50] I’ve heard from one of the large publishers, someone that works for them, that there is a move away from textbooks. That they’re not actually going to make physical books. Of course, the next nightmare for the next 10 years is electronic versions of the same format of old paper textbooks, which is even worse then because the affordances of a book in class aren’t there, but maybe we’ll move beyond it. [14:09] A lot of it, I think, it’s driven not necessarily by publishers, it’s driven by students. In my experience in the last 10 years, they want security. Students feel unsure if they can’t calculate answers, very focused on accuracy, even if the instructors don’t want to be that. [14:25] Sometimes the students are the ones that want closed in things that they can get out of the way and get on with their lives and kind of force, almost push, for these less meaningful interactions. Stacey: [14:35] For me this is an EdTech problem. How is our EdTech so disconnected from actual teaching and learning, and is this student perception or is it that our EdTech isn’t working? Lee: [14:47] In my limited experience, the first problem that’s changed for me in that is that the students aren’t making connections that I feel like they used to make, or perhaps I was even oblivious to before. I think across the board I’m finding myself needing to draw for everything we do in class why we’re doing it. Lee: [15:13] More sophistication or “Show me why this is important.” Sometimes, for instance, I’ll have them do things out of class that are totally related to in class, but they don’t make the connection as easily as I do. It may not just be the materials, it may just be an instructor or us as teachers trying to demonstrate to these students how it all fits together. Bill: [15:33] One of the things that we’ve done, we’ve encouraged instructors to do…Because I can’t obligate them to do this because we’re not experiencing that problem, the disconnect, because the flow…We wrote the materials, so that was built into the flow from outside to in class. [15:49] What some instructors do, when the students first get there, is they borrow one of those online activities as the warm‑up for class and so the students go “I did this last time, I remember this now,” and then naturally segues into the first thing they want to do in class as part of the task building they’re doing. [16:03] Students may really see the connection because they see how that thing is leading to this thing here. Those of you who aren’t watching, I’m moving my hands like this back and forth, to show the lead from right to the left. Bill: [16:15] Who can talk without hands, right? Stacey: [16:17] This should be a video podcast. Lee: [16:18] That’s very good. I’ve been working with the Can Do statements, like you and Walter have been doing, and when I have them do practice outside the class, they see how it connects, they feel a lot more fluid because they know what they’ve been training. More practice outside the class is then affirmed and re‑enforced and validated in class. Bill: [16:36] There’s two things also that tie into this whole ‑‑ it’s part of the EdTech thing, but it’s part of language teaching more generally ‑‑ is until instructors can see other ways of assigning grades and assessing students, you’re not going to have much change. Because as long as people are bound to a textbook, then you test the content of that textbook so what do you wind up testing? The things you can test. [17:02] What do you need for that test and then your textbooks wind up looking the way…I mean, it’s a vicious circle within the textbook [indecipherable] itself. One of the things we did, we got rid of tests. [17:37] The good teachers don’t get that because teachers who don’t know how to communicate why we do it, that’s when I see those in evaluations. We never get that in the first year because you get them fresh and the people teaching the first year know how to communicate that stuff. [17:54] It’s the people coming in, and you can see on the evaluation forms who had Spanish with us the first year and who’s coming in. You can see it on the evaluations. [18:07] They’re used to paper and pencil tests. I’m going to get a law degree, so I need to get an A, I need to get a 4.0 so I need to show some knowledge and those kind of things. That then feeds back in the EdTech part because what helps you take a test? Outside activities that help you take a test. [18:40] What would a first or second year language textbook, what would that online or electronic component do for students? What would it look like and how would students interact with that? Lee: [18:50] Hopefully we’re at the beginning of a new era in that way of trying to figure it out. I think the first thing comes with getting rid of that idea of textbooks. It’s its own genre. [19:01] They all look the same, they all have rules of what’s true or what’s not, what has to be in there, the 30 page introduction for instructors to leaf through to see if it’s going to cover preterite in the second semester or not, and these other checkpoints. [19:13] Getting rid of that is very disconcerting to both students and teachers. I had a program that adopted Auf Geht’s! right when it came out. The lead instructor was very excited, very communicative and such. Then these two German teachers that taught with him took a look at it and uttered in dismay, “This isn’t a textbook,” which meant to them we can’t use it. [19:34] The question was whether this actually helps them learn German, not is it a textbook. We have to keep moving away from this idea of this monolithic textbook. I don’t even know what else to call the next thing, language learning materials? I don’t know. There’s not an easy word for it. [19:50] I think it’s going to involve, like Bill has said, students demonstrating comprehension as much as possible. I think it should include a lot of authentic audio. I’ve been a big proponent of that. I have a lot of good reasons to do that in order to lower, if you want to call the effective filter, at least student’s nervousness in listening to real native speakers or speaking to them. [20:09] They need a lot more input than they get just in the class time and they’re not the biggest readers, so I think it needs to be lots of video, lots of listening. While I’m a big proponent of authentic, it has to be also very comprehensible too. There has to be a good mix. [20:22] That’s going to look very different. Students might be taken aback a bit because it takes time. It takes time to listen to stuff. It takes time to interact with materials and they are pretty busy. I think that’s one of the problems. To make these materials more effective, we’re going to have to find ways to have the students spend more time doing it and not be angry. Bill: [20:43] In my ideal world, you work backwards and you go, “OK, so what are going to wind up doing in class? What’s that going to look like?” Then that’s going to dictate to us was going to happen outside of the class. In my ideal world, of course, I’m task driven, I like tasks to frame each and every class, if possible. [21:25] At the end of that week, we’re going to do a task that Jim Lee and I have called “Sedentary or Active,” where you get information from people about what they did last night and then you share information about yourself and so on. [21:40] Then you find out how sedentary or active people are based on that and you compare yourself to a national norm and that kind of stuff. You’re actually learning something, you do some critical thinking along the way and so on. Then there’s mini tasks that you do along the way. [21:52] For example, one mini task that you do the day before would involve cell phone usage. You talk about how connected were you last night? Did you spend time on your cell phone? Were you on Facebook or on chat? What were you doing? [22:06] All this feeds into this idea of what did you do last night? What does this tells us about ourselves? When you work backwards from those, those are going to be your tasks. Every day, you are doing a task like that. What are you doing outside of class to prepare you for that task? [22:38] All those kinds of things will feed into what you’re going to wind up doing in class, both in terms of the content and in terms of any vocabulary you might need or functions you might need or something like. That’s what I think should happen. [22:55] I think materials, both for in class and out of class, don’t need to be print. In fact, they shouldn’t be print. Walter and I are now moving toward a system by which you’re going to be evaluated. We’re changing our evaluation form. We’re adding a new question on there for the TAs and the instructors when we observe them. [23:15] One of the questions we’re going to have is “Does the teacher minimize the use of textbook in class?” We actually have some teachers already, you go and observe them or they turn their videos in to me to watch, and you never see a single textbook open. Everything’s on a screen, which has all the faces up and interact with each other instead of having their faces down. [23:33] I think that’s what we need. We need more of that because textbooks get in the way of interaction. Lee: [23:38] I’m sort of semi to where Bill is. I still see a use for print, whether it’s in a book or not, but it’s a lot less than it was before. I don’t think that bringing this huge textbook with all the grammar explanations, there’s nothing necessary about that. Some of my own activities in the books I do are done outside of class to prepare class for in class interactions right in the text itself. [23:57] That’s something that could be handled in hand‑outs as well, if you think print is a better use, if it keeps students focused. I think it seems now screens are ubiquitous. Even a few years ago they weren’t, but it seems now you can pretty much count on there being some way to display information visually to a whole class. [24:14] That’s making me rethink my own materials because half of it is that. You can just display this on a thing. I think next versions of my book are going to be a lot thinner, even if they don’t totally disappear and go electronic, for that very reason. I think that’s the way things are moving. Bill: [24:27] I taught a third year conversation course with no book. I used Pan’s Labyrinth as the “text.” I divided it up into seven segments and I created seven two‑week units around these segments. I created all the materials myself, they went up online and we used D2L, Desire2Learn. [24:46] All the stuff they needed was there. All the activities prepared them for class. Then I had in‑class tasks we did and then once every two weeks we had movie day where…they watched the segment outside of class, and did different things with the segment, but then we re‑watched it in class. By the time they saw it in class, they were seeing it for like the fifth time. Talk about input. Bill: [25:08] Then we would stop and do things. One of the things I got from the students was, “Thank God there was no textbook because one, you saved me money, and two, I didn’t have to lug anything around.” It was a conversation class, but I made them do little, mini writing tasks, too. [25:28] Not a problem. Between an iPad or a laptop there wasn’t a single student who wasn’t prepared to go. Now, that’s Michigan State, but we’re not a rich school. We’re just a state school. We have a lot of students who are still first time goers to Michigan State. We have some who aren’t, obviously. [25:44] It might be harder in some schools to do that, but I can do that. That’s why I say, a lot of stuff is local. Decisions you make about stuff sometimes is locally dictated. I do it myself before I give it to a publisher for a variety of reasons. I don’t want them to change the content. [25:58] When you try to sell…have you ever seen a conversation book? I don’t understand the concept of a conversation book. It’s an oxymoron to me. What you’ve got to do is get out there and start laying the groundwork. [26:12] Next year, I’ll start presenting this course, for example. Maybe present it and then maybe put the materials out there for people who want to learn how to do this. How do you teach a course without a book? Here’s how you do it. Lee: [26:28] I would jump in and say they should take Bill’s approach. This is why we should get rid of textbooks, or at least that word textbook, because it gives to somebody else both the power and the responsibility to create my course. What Bill has talked about here is creating his own course. He wants to do it around Pan’s Labyrinth, so he put it together. He took the time and he did it. [26:47] More of us need to do that. As we do it with open resources, and share it, I think we can swap it around with some other people. You don’t need a publisher to do that. [26:56] As long as an instructor’s willing to except that it doesn’t have all the bells and whistles of these big course management platforms, which by the way are the things that are jacking up the cost of these things because they’re mega billions to develop. [27:08] It’s stopping development at the lower levels. If all of us as instructors expect these bells and whistles and everything, then it’s only going to be the major publishers that even have the money to put those things out. Stacey: [27:18] If a teacher says, “I don’t have the experience, knowledge or confidence to build my course from the ground up,” how would you respond to that? Bill: [27:28] Everybody can. You just need to be encouraged. I don’t think there’s a single person at this conference, for example, who couldn’t do something and do it decently. It may not be excellent, but the conversation course…actually, it wasn’t the best online stuff, but it was decent. [27:45] It was a solid course. It got super high evaluations from the students. I know it could be better, but the time constraints I had, this is what I did. Now when I teach it again, which is next year, I’m going to go back in before and ask someone…By the time I teach it the third time, it will be what I want it to be. [28:01] That’s OK. Sometimes people need permission. It’s OK to just be good enough when you start. The world isn’t going to end if you’re good enough, but think of the alternative of doing nothing. Start somewhere and just do it. I don’t think there’s a person who can’t do something. If you just show them a little bit how…God, the resources online, right Lee? Bill: [28:26] You just Google how to do X and you can find on Google how to do something. “How do I do this on a platform? How…?” Universities everywhere have workshops and tech people who are dying to help you and they’re interested in this kind of stuff. [28:39] They go, “We’ve never had a language person come here and ask, so this is kind of interesting.” You can do it. Sometimes people need permission, too. We’ve been doing this now since the mid ’90s. I have been doing this since the mid ’90s and everything I teach has a component like this. Lee: [29:12] I just repeat what I said before. I think there’s lots of good uses for technology out there. You can get a very acceptable version just putting materials together yourself and linking them to a simple blog. You don’t have to go through a publisher’s thing. [29:26] That adds a lot of costs. I would encourage everyone, if you want to use publisher materials, don’t just assume students are practicing outside class because there’s this online platform they’re ignoring. You need to get into it yourself, see how it works, see where they’re learning, see what’s frustrating and then evaluate whether it’s something you want to use or not. Bill: [29:42] You also have to put the incentive into the course itself. The outside work for our class is 25 percent of your final grade because it is a hybrid flip. There’s one hour gone, so that one hour was 25 percent of the course, so 25 percent of your grade is this. Here’s posted outside of class. Not a problem, students do it. Stacey: [30:02] Another thing I think that I’ve gotten from this conversation is that the textbook publishers are not the experts. Teachers have permission to believe that they’re the experts on their own course and they can design their own materials. They don’t have to rely on someone else’s technology; they can go ahead and build it themselves. [30:18] And it may not be great the first time, but that’s OK.
Lee: [30:22] If the instructors are the ones who are consciously setting the objectives and goals for their course, and they’re deciding whether these print published materials assist them or not, that’s already a huge step. Instead of just assuming this is first‑year language, I need a first‑year textbook, and learning what’s in it and just doing it. Stacey: [30:40] Any other technologies that you’re using in your class? Bill: [30:43] Absolutely. I use Google Classroom for example for group writing activities I do. There’s other things that we use to maximize stuff. Lee: [30:54] I’ve used Kaizena for assessing student writing, which is a site that allows you to give feedback a little bit more detailed than Google Docs. Bill: [31:03] We used ELI for a while. I love ELI and all of the guys at MSU who developed ELI, but it’s really geared towards typical rhetoric and composition courses for native speakers of English. We’ve adapted to our needs, but the problem it has is the teacher can’t go in. It’s supposed to be student only interaction. They’re big on peer and which I agree with. [31:25] We do do that, but then at some point the teacher needs to insert him or herself and tell the class or tell others, “I think you missed the point here that this is not a good opening sentence for this essay you’re writing.” The teacher can’t do that. [31:55] When I switched from individual writing to group writing mid-semester, which was a fabulous decision by the way, one person was in charge of opening the document. The other person would log on away and then they could type stuff in. It was great. Those kinds of technologies will work really well in class. I think so. Stacey: [32:10] The last question that we ask everyone who’s on the podcast is what is your favorite analog educational technology? Lee: [32:22] I’ve used PLAYMOBIL with good success in class. Lee: [32:27] The toys yeah. If we’re working on prepositions or verbs, I’ll have them create things out of PLAYMOBIL castle sets, other things that I bring along with me and then describe what they’re doing. Stacey: [32:41] Derek, I loved the answer that Lee gave there. I don’t think we’re going to get another guest on this podcast who mentions toys as their favorite analog technology, but I think it’s a good idea. Toys are fun, they’re engaging and when the teacher walks into a classroom with an arm full of toys, I think students will definitely be curious about what is in store for them in this class. Derek: [33:04] I would think so. I can’t remember the last time I’ve used a lot of toys in class, but I do manage to work in board games from time to time. I’m a big board game fan. I start my linear algebra course by handing out photocopies of a Monopoly board and I ask students to analyze what strategy there is in the game. [33:20] As it turns out, there’s a good piece of Monopoly that you can model using some techniques from linear algebra, so it’s a nice kind of introduction to what you can do with linear algebra in, what I think, is a kind of accessible way. Just last week in my statistics course I used a couple of other more interesting board games to talk about basic concepts in probability. Stacey: [33:37] I would really want to stay for the rest of your linear algebra class if we did board games on the first day. Derek: [33:53] Details. Our guests this episode were Lee Forester of Hope College and Bill VanPatten from Michigan State University. You can read more about both guests and their work by following the links in the show notes. [34:04] Speaking of links, Stacey has more to share on this topic of digital textbooks. Can you tell us about the resources you’ve put together? Stacey: [34:13] I’m happy to. As you mentioned I’m the assistant director for educational technology here and I’m really interested in learning platforms and what they can do so I put together a teaching guide. Here at the Center for Teaching at Vanderbilt we have an extensive collection of what we call teaching guides. [34:28] As part of my work on this episode, I put together a collection of resources that are words of wisdom from other faculty members about how to make good use of publishers’ online learning platforms. I hope it will be useful to others. It was really interesting for me to put together and that resource is available to anyone who’d like to access it on our website, cft.vanderbilt.edu. Derek: [34:53] Great and we’ll have a link to that in our show notes. Thank you, Stacey, for those resources and for taking the lead on the interview in this episode. Stacey: [35:01] It was my pleasure. Derek: [35:03] You’ve been listening to Leading Lines, a podcast on educational technology from Vanderbilt University. 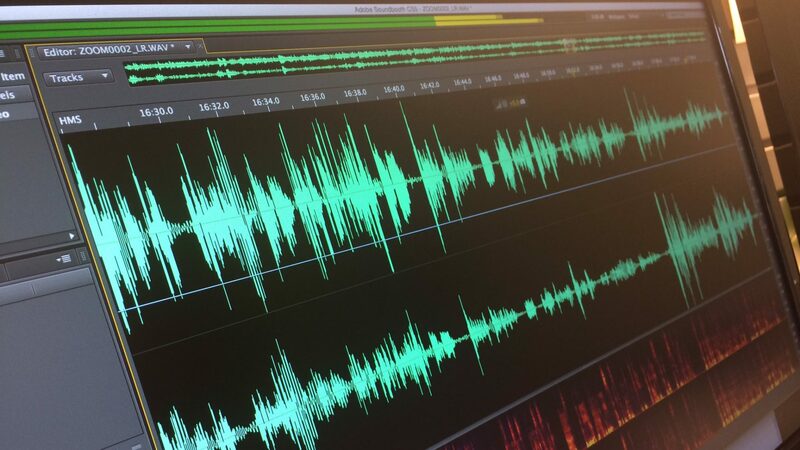 The podcast is produced by the Center for Teaching, the Vanderbilt Institute for Digital Learning, the Office of Scholarly Communications and the Associate Provost for Digital Learning. [35:15] You can find past episodes on our website, leadinglinespod.com and you can follow us on Twitter where our handle is @leadinglinespod. If you would take a minute or two to leave us a rating or review on iTunes, that would be great. Look for new episodes of Leading Lines the first and third Monday of each month. I’m your host, Derek Bruff. Thanks for listening.